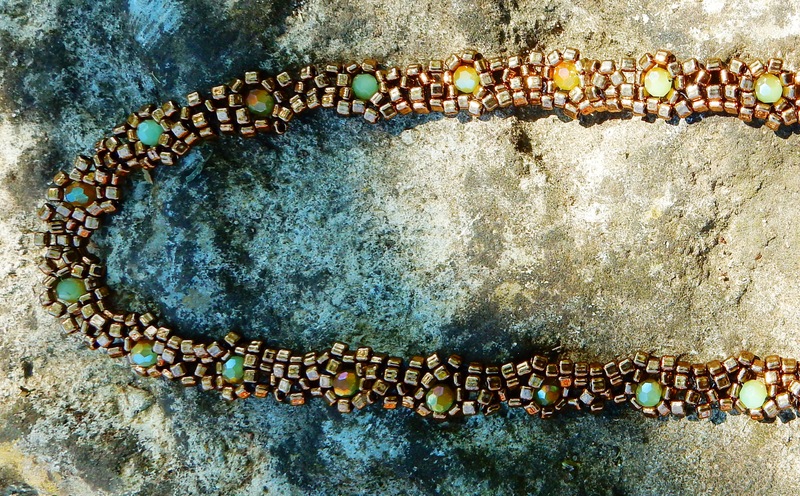 Because summer is here, today we’ll be talking about a girly beaded pattern. It is a light, flimsy, feminine one with the power to turn plain into inspirational. We give you … the Daisy chain. Flower power has never been better represented than with this fun stitch. It works great as a bracelet, a choker, a headband and why not, even a great anklet to go with those beach sandals. 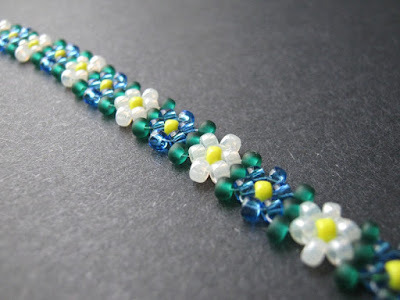 For those of you who love minimalistic style this is good news, because there is almost nothing much smaller than a daisy chain in the world of beading, (except maybe just stringed beads). So as you can see, it’s not very complicated, maybe a great little project to work on with your teen daughter. 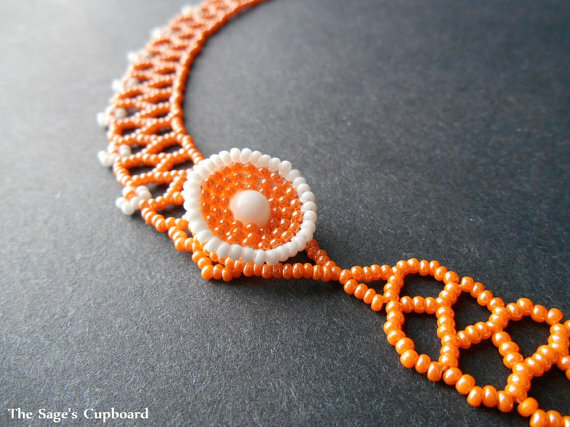 If you want to pump it up a notch, there’s also the Native American variant, also called Potawatomi Daisy chain and you can see on the Inspiration Beading blog how it’s made. Mortira Natasha vanPelt the owner of sagescupboard shop and Inspiration Beading blog took the daisy stitch to a new level and successfully mixed it with other techniques to give the piece a romantic and cheerful look. Danderneko says the button gets additional points . I agree is a nice touch. On Etsy, we found 3xbandsandstuffx3 shop that has a couple of them in summer colors. On TheMayanMarket shop you can also find this chain as a glasses holder chain. Dandereneko: Oh, that’s so pretty, my mum would love those! She always loses her glasses around the house. Another simple variation happens if you go a bit zigzagging in between the flowers, something that WowSun shop like to do. Most of the time the Daisy chain has a hippie/boho feel to it and then you shouldn’t have to spend too much money on it. But with the right materials and inspiration, it can also turn into a splendid piece of jewellery. 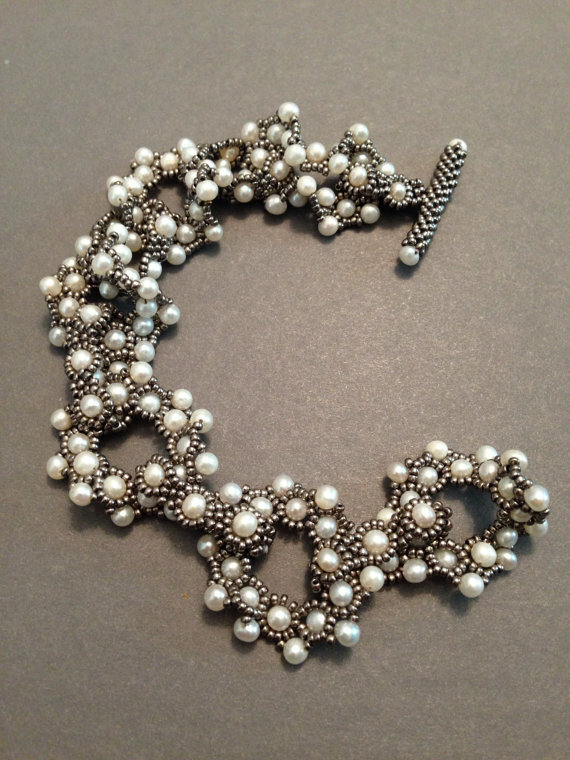 Take for instance this bracelet with pearls and seed beads. Not so casual anymore, is it? 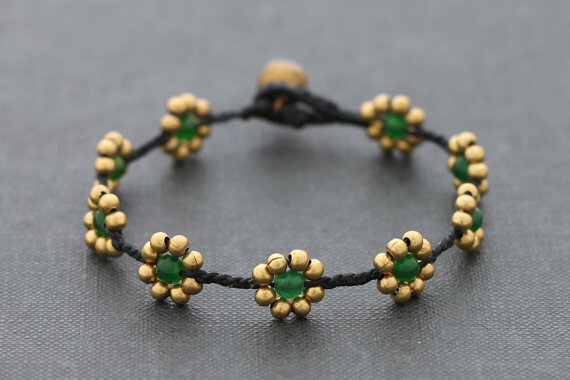 Beth Stone, the lady that sells this bracelet, has a professional hand and a couple of other gorgeous designs on her shop. Don’t be fooled though, the little Daisy has even a greater power. Mixing the right size of beads creates the compact aspect similar to the metal jewellery. Here is an example of a DereDere work in progress creation as well. Look forward to it.